The former Oasis frontman and the grime star both celebrated their birthdays this week. Liam Gallagher and Skepta have proved their bromance is still ticking along nicely. The Wall Of Glass singer took to Twitter to thank his fans for all the "birthday vibes" after turning 45 on Thursday (21 September). It wasn't long before the Shutdown star chimed in and informed him it was actually his birthday two days before. Upon learning they share the same star sign, Liam Gallagher was quick to give the Boy Better Know star an invite round to his house, and even claimed to have a present for him. This isn't the first time the pair have hit it off, previously exchanging kind words, with the For Heaven's Sake rocker praising Skepta for "keeping it real" and the rapper saying "Liam's in touch". Meanwhile, Liam Gallagher is preparing to release his debut solo album As You Were on 6 October, and he's convinced his brother Noel will secretly like it. While he thinks his brother will like his record, the chance of an Oasis reunion has never seemed so far apart with their children now seemingly feuding. After his initial posts were deleted, he appeared to still hit out at his cousin, suggesting whoever chose her to model for Tommy Hilfiger should go to Specsavers. What's most shocking is that Gene's tirade comes after he posed for a snap with his cousin just two weeks ago. 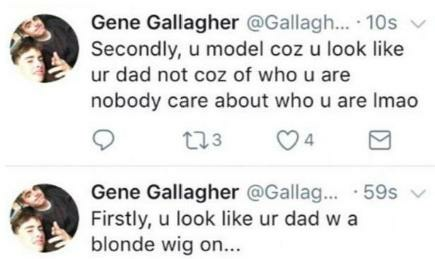 Anaïs, the 17-year-old model and daughter of Noel Gallagher took to Instagram to share the image alongside the caption: "Big up that fam love". While it's unclear what's transpired between Anaïs and Gene in such a short space of time, it's definitely not going to do anything for their fathers' reconciliation. Meanwhile, Noel performed at We Are Manchester on Saturday (9 September), which saw the Manchester Arena re-open its doors following May's horrific terror attack. The Ballad Of The Mighty I singer appeared to get emotional during his rendition of Don't Look Back In Anger, but he later revealed exclusively to Radio X that he wasn't actually crying.